Online Store lets U.S. customers using dollars create shipping labels for their products. Click the Store tab and choose Orders. Click an order on the Orders page. When the order opens, click Get Shipping label. Note: The first time you use Shippo, click Sign up and follow the prompts to create a free Shippo account. Each label costs $.05. If you've already created an account, Shippo asks you to log in to proceed. Shippo automatically imports your Online Store's order information, so pick an order and click Create Label. Note: Create labels only for Paid orders, not those marked Payment pending. 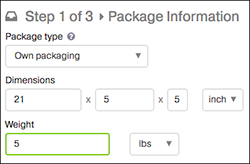 Click the Package type menu to choose a standard Shippo package size, such as Flat Rate or Regional Rate box. Or select Own packaging and add its dimensions — then enter the total weight. 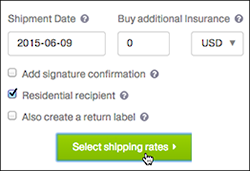 Enter a Shipment date, decide whether you want to Buy additional insurance, and select any of the additional options before clicking Select shipping rates. Decide which of the listed carrier shipping rates you want to use and click Buy Label and follow the instructions to print the label. Note: By default, only U.S. customers see USPS rates. To add other shipping carriers, click Carriers in the left column. See Add Shippo Carrier. Trouble connecting your Online Store to Shippo? Don't see Get Shipping Label in Step 5 or getting an error? Click Chat With Us at the bottom of this article. Need help printing a label in Steps 8-11? Search the Shippo Help Center. To learn more about Shippo, watch the tutorial video. Or read their blog posts on Essentials to Simplify E-commerce Shipping: Part 1 and Part 2.